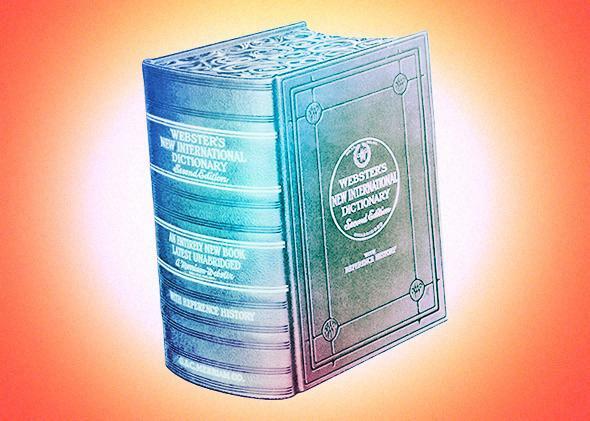 The future of the dictionary: Behind Stefan Fatsis’ story about the revision of Merriam-Webster’s New International Dictionary, Unabridged. What Does “Unabridged” Even Mean Anymore? And four other questions Lexicon Valley’s Mike Vuolo asked Stefan Fatsis about his piece on the remaking of the Merriam-Webster dictionary. Photo illustration by Slate. Photo courtesy of Merriam-Webster Inc.
Mike Vuolo: First of all, congratulations on a fascinating piece. It’s easy to forget that a dictionary is in fact a collection of very smart and dedicated humans curating, more or less anonymously, an authoritative exhibit of our language. In an age of information democratization, we somehow continue to believe in the concept of “The Dictionary” and turn to it as if it were an incontestable guide to the constellations. Why? Most people don’t give a thought to how a dictionary is created. It’s just a reference book, with no one’s name on the cover except for that of some big publishing institution. A dictionary is designed to sound impersonal and anonymous, with a from-on-high tone that conveys creation-theory-level certitude. With those qualities, I think it’s an easy jump to believing that there is but one correct answer to questions like, “Is that a word?” or “What does that mean?” Or, that there is one dictionary—“the” dictionary. Humans are conditioned to seek simple answers. But language is incredibly complex. Even now, in what you rightly point out is an age of linguistic democratization—people are inventing and defining words, and publishing those definitions online, every day—we still want to know what “The Dictionary” says, we want that oracular knowledge, that one satisfying answer: “The Dictionary” says this is a word, case closed. That turns out to be good for a traditional dictionary publisher like Merriam-Webster, which is staking its future on the belief that people will continue to seek out and trust the cachet and authority and history on which its reputation is based. Vuolo: Merriam-Webster—which you call “the last fully staffed American dictionary-maker standing”—has begun work on the long-rumored revision of its signature tome, Merriam-Webster’s New International Dictionary, Unabridged. The most recent, third edition of that book was published more than 50 years ago. But with word look-ups having migrated largely online, where space is theoretically unlimited and updates are untethered from a publication schedule, what does “unabridged” even mean anymore? Fatsis: Not much. The last printing of Webster’s Third had 467,000 entries. The book ran to more than 2,700 pages. That sounds enormous but is in fact a gross abridgment of English vocabulary. As I write in my story, every decision that every editor of a print dictionary has ever made had to do with space, the finite amount of it available between two covers. The Third whacked tens of thousands of entries from the Second (published in 1934) to make room for new, modern words. The space issue made lexicography both simpler and more complex. Simpler because the application of space-based standards made it easy to leave out words with few examples of usage in print. More complex because borderline calls still had to be made and words with decent penetration in the language were often left out. Whacking isn’t necessary anymore; there’s all the room in the world. So the question becomes one of standards: Do we need lexicographers to make subjective decisions on whether or not a word rises to some nebulous standard of use that qualifies it for entry? Or, as sites like Wordnik espouse, should we just be acknowledging the existence of words and let search engines do the heavy lifting? For Merriam and its competitors, the trick—and key to survival—will be finding the balance between the rigid lexicographic rules of yore and the chaos of the Web. Vuolo: Adding newfangled words to a dictionary is as much a media story as a lexicographical one. The real bread and butter for Merriam-Webster, in terms of page views, remains old staples like culture and pragmatic and democracy and love. What do the data tell us about the way people actually use dictionaries? Fatsis: Merriam has been collecting data on lookups since 1987, and in 2010 it started posting Top 25 lists for daily, weekly, and all-time searches on the front page of its website. The data show a few main things. One is a confirmation that English can be tricky, and that people aren’t afraid to admit when they’re stumped. That’s why words such as pragmatic and insidious and ubiquitous and pedantic top the all-time lookup charts. The other is that, like everything else, lexicography is news-driven. When people read or hear a word with which they’re unfamiliar, they’re not afraid to look it up. This has been good business for Merriam; its editor at large, Peter Sokolowski, has built up a large Twitter audience (12,000 followers) in part from explaining what event might be driving a spike in lookups of a particular word (alchemy surged after George Clooney used it in a Golden Globes acceptance speech last weekend). More broadly, the data has been transformative for how Merriam conducts its lexicography. Knowing what words people look up the most has allowed the company to revise those words before others—service lexicography in the digital age. Merriam devoted very close attention to updating the most frequently looked-up words for its Unabridged project, and is assigning further revisions in descending order of lookups. This is just a small example of how the user experience will help to redefine lexicography in the Internet age—both how readers use dictionaries and how dictionary-makers cater to the needs of their users. I came away from reporting this story pretty sanguine about the future of dictionaries—maybe not the printed kind, but the art and craft of lexicography, for sure, and the likely demand among users for dictionaries, no matter what they might look like. Vuolo: Who coined the term lexicography? It’s a very satisfying word. Fatsis: Yes, it’s totally got it all. We can thank my people, the Greeks, for the root words, of course. Wikipedia breaks down the roots using a Greek-English dictionary: Start with λέξις, or lexis, meaning speech or word, and move on to λεξικός or lexikos, “of or for words” and add in γράφω, or grapho, “to scratch, to inscribe, to write.” So, the writing down of words. The Oxford English Dictionary says that lexicography was first used in English around 1680 (though Latinized forms of dictionary apparently go back to 13th-century England). In any case, lexicography is lovely: It’s got strong roots, it’s a nice blend of those roots, it’s complicated enough to make people think—I was surprised at how many looked at me blankly when I said I was writing about lexicography—and it rolls off the English-speaking tongue.